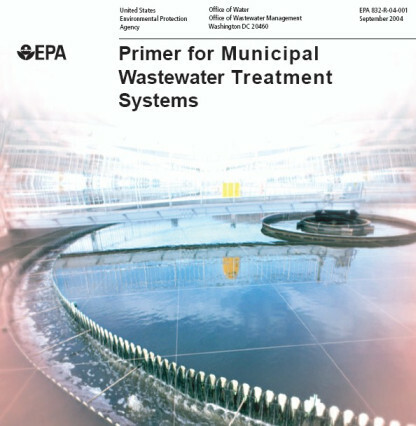 Have you ever guided visitors at a treatment plant? If yes, you know what is one of the first questions when they come to final clarifiers. If the clarifiers don't have scum baffles (sometimes called boots), the question is "why?". If they have boots, the question is the same. In short, boots are a popular discussion piece. Actually, not much can be seen and photographed at a clarifier in operation. Thus one can see photographs of launders everywhere. They are a kind of a symbol of wastewater treatment. Orthodox "booters" have psychological difficulties to digest that EPA primer front side clarifier does not have boots. Weir plates are attached to the outer (sometimes to the inner) wall of the launder. Scum baffles can be attached to the launder (as an option) at the inner side of the weir plate. 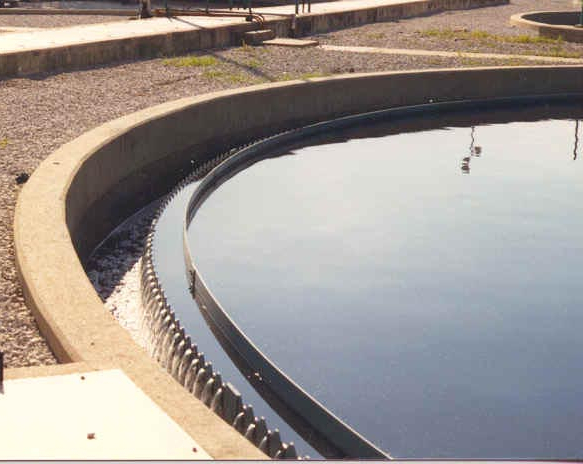 Scam baffles retain solids floating on water surface inside the clarifier and prevent their escaping over the weir plate. Typical height of baffles is about 300 mm; one third above water level, two thirds below. Most frequently, especially at old-fashioned clarifiers, scraping is not perfect at all places of the clarifier bottom. There are smaller or larger "dead spots" where sludge rests undisturbed for a long time. From time to time, sludge "doughnuts" are released by gases and rise to water surface. Those doughnuts have frequently a non uniform colour. Some parts are darker while other lighter. Sludge rises (more or less intensively) if its density is low because of entrapped light density solids, liquids as well as gases. Most common reason for rising sludge is denitrification in the sludge blanket. For details on rising sludge, see Henze et al. (1993). Many treatment plants suffer by biological foaming. Layers of biological foam can be extremely high, up to 1 m if retained in a tank or a tank compartment for time long enough. In winter, if ambient temperature drops below freezing point, the foam freezes and can cause mechanical damages to the equipment. Final clarifier of the pilot plant treating the same wastewater as on the left picture. Crystal clear water surface, very little biological foam, if any. What would be scum baffles good for? Scum baffles are an option, like mud flaps behind your car front wheels. In that case one has to consider the drive system (front, rear or 4x4), what roads he drives, does drilling or other attachment cause more damage to the car than occasional driving on dirty roads without flaps, what are other options to reach desired effect. Decision process on scum baffles is similar. Very little science or engineering, just rational consideration of circumstances and experience. Sludge doughnuts originate in wrong design/operation of clarifier scraping system. Usually it is cheaper and more efficient to reconstruct scrapers than to install scum baffles and scum removal system. 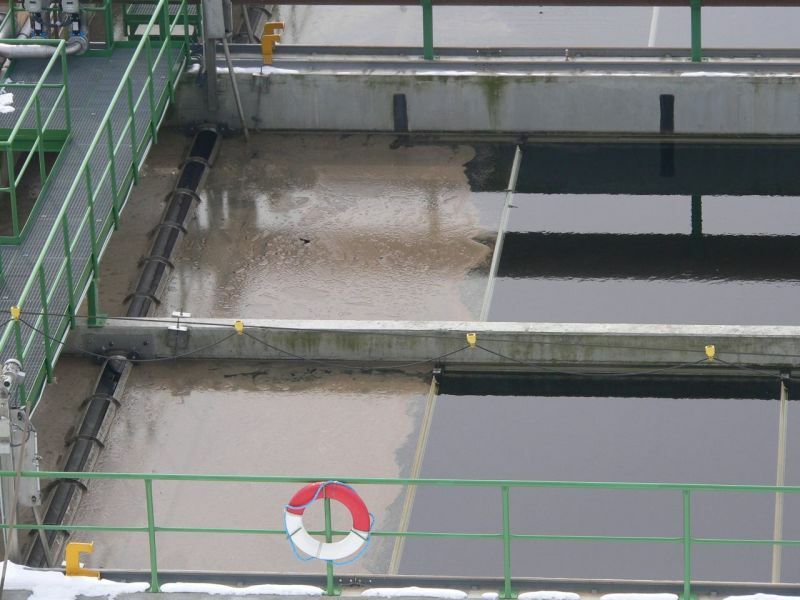 Rising sludge is the consequence of insufficient denitrification capacity of the activated sludge system. Scum baffles and scum removal system can be, of course, installed but rising sludge flocs will still escape from clarifiers because not all of them are light and large enough to reach water surface. Thus they will leave clarifiers with the effluent anyway. In most cases, money would be spent without reaching a significant effect. The only available and correct solution is to upgrade denitrification capacity of the activated sludge system. Biological foaming is a disaster to many treatment plants these days. Practically applicable prevention methods are far ahead, though for instance Microthrix parvicella is sensitive to addition of aluminium salts. Thus operators have to learn how to live with foam, how to keep it manageable and where to dispose. Several control methods (treating symptoms) are applicable, none easy, cheap and perfectly efficient. Even if the basic rule is to remove as much foam as possible prior to clarifiers, there will be always some foam on clarifier surfaces. If clarifiers have a flocculation well, it is advantageous to remove foam also from over there. Last option to consider, if all other had been already implemented, is to install scum baffles. Installing scum baffles first (or only) is like catching a dog by the tail. In conclusion, it is wise to investigate why there is too much scum on clarifier surface and make rational decision afterwards than vice versa. 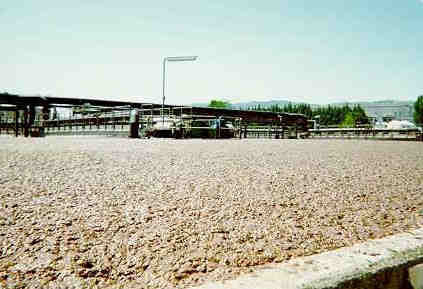 In many plants, "boots" were removed and the operators believe that they have less foaming and better effluent quality. In other plants, "boots" were added and nothing has improved. Still, in another plants, "boots" were installed from the beginning and the operators are happy with them. Each case is a bit different and an universal advice is useless. No wonder that some experts on clarifiers say: Much ado about nothing. 1. Remove as much scum as possible before clarifiers! 2. Do not recycle the scum back! Scum should be disposed off! Does a perfect surface scraping exist? Definitely yes, have a look! This is exactly the case where most of the floating sludge is removed before the clarifier.